I have really enjoyed every second of this week so far! 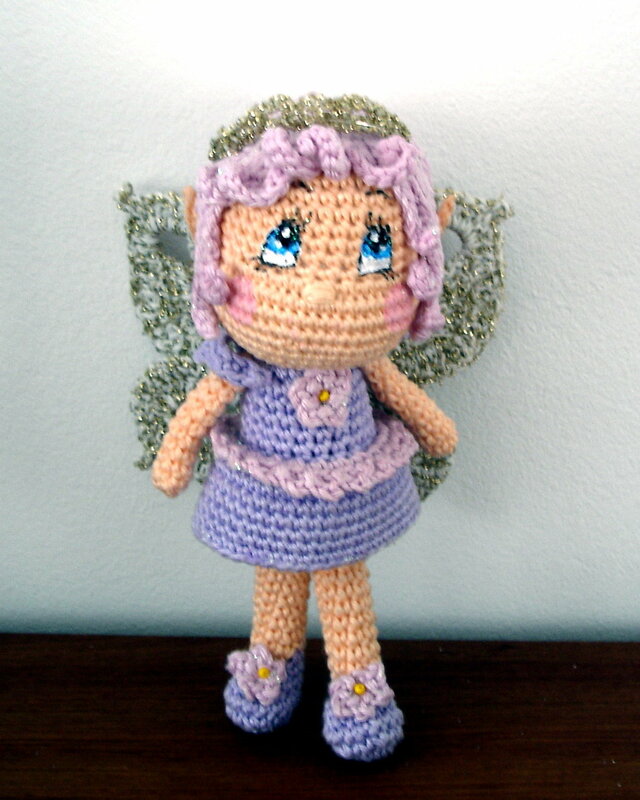 Making Fairies is more than making crocheted dolls it is making fantasy world come true. Making magic! 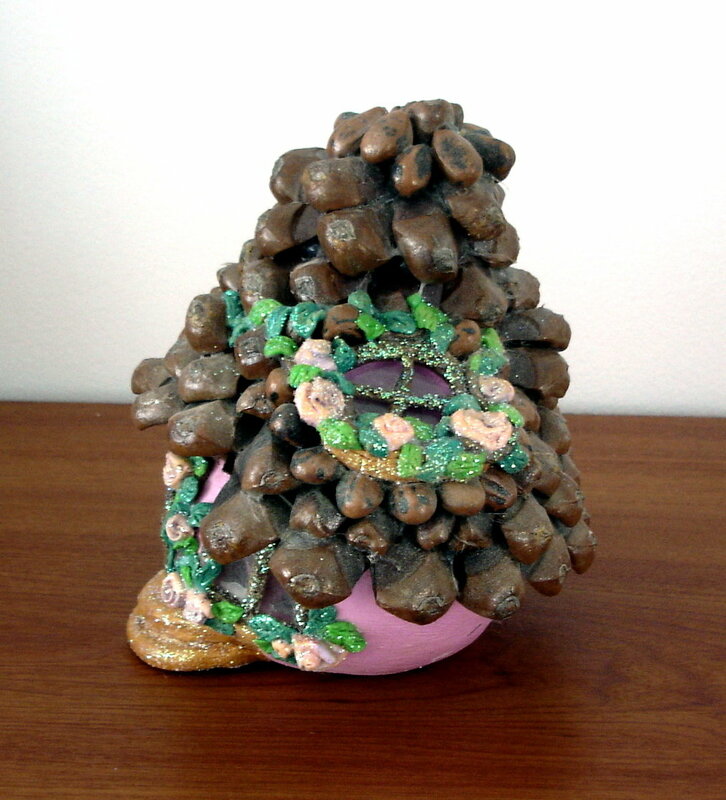 Good news is, I have finished the Fairy house, and have made two more fairies finishing the pattern for this doll as well. The fairies you have seen and here is the house, ready and waiting for my niece to come. There is furniture inside, but the door started to crack and had to glue them in order to keep everything in one piece. Was hard for me to make a photo to show you interior of the house. With 0,4 mm wire I made tiny chair, table and baldehin bed. added seed beads in pink and purple, pink tulle for baldehin. Heart shaped carpet in white felt on the floor, tiny little pink felt pillow and blanket. Two paintings I glued on the walls…. It is cute. All is very tiny. Chair is less than 1 cm high so you can imagine what kind of work that was. Will let you know what my niece will say when she sees the house! Think we can continue with our fairies and the pattern. As you can see there are three different hair styles and I will try to give you pattern on how to make all of them. Possibilities on making the fairy are really endless. With this basic pattern and little of your imagination you can do miracles. And I really hope you will! 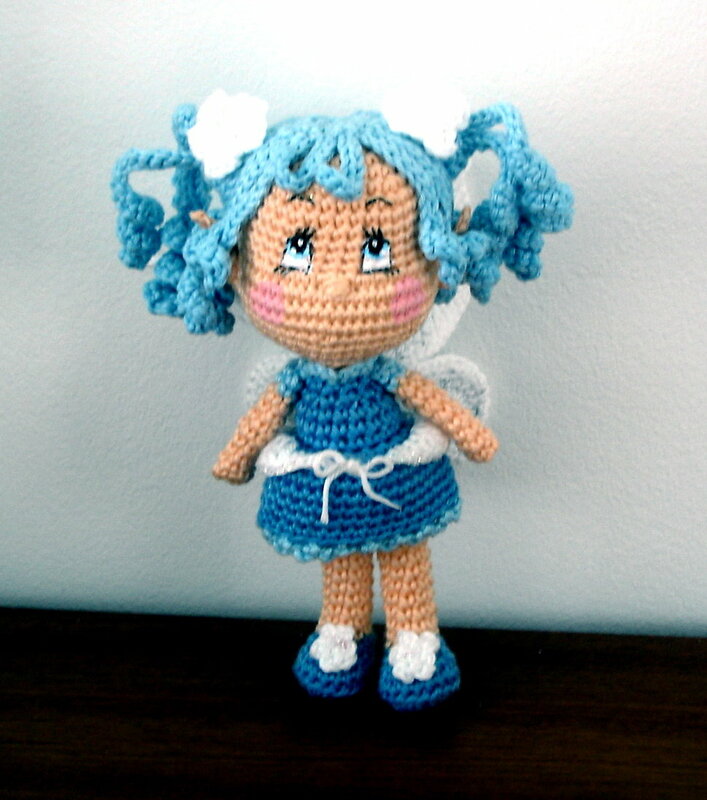 Hope you will enjoy every second creating magic in your own home, making one of these cute ones. 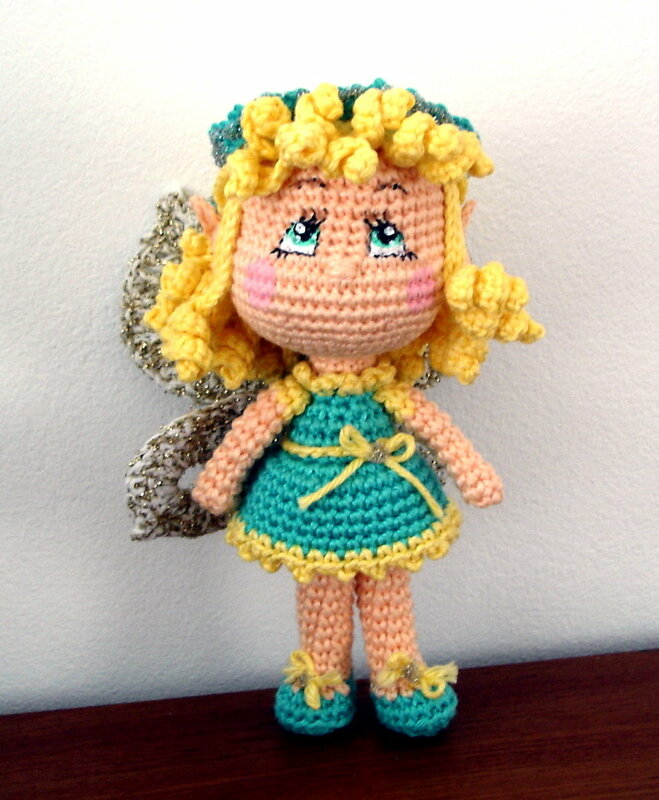 For the fairies I have used 2 mm crochet hook and Patons 100% cotton yarn, DK. 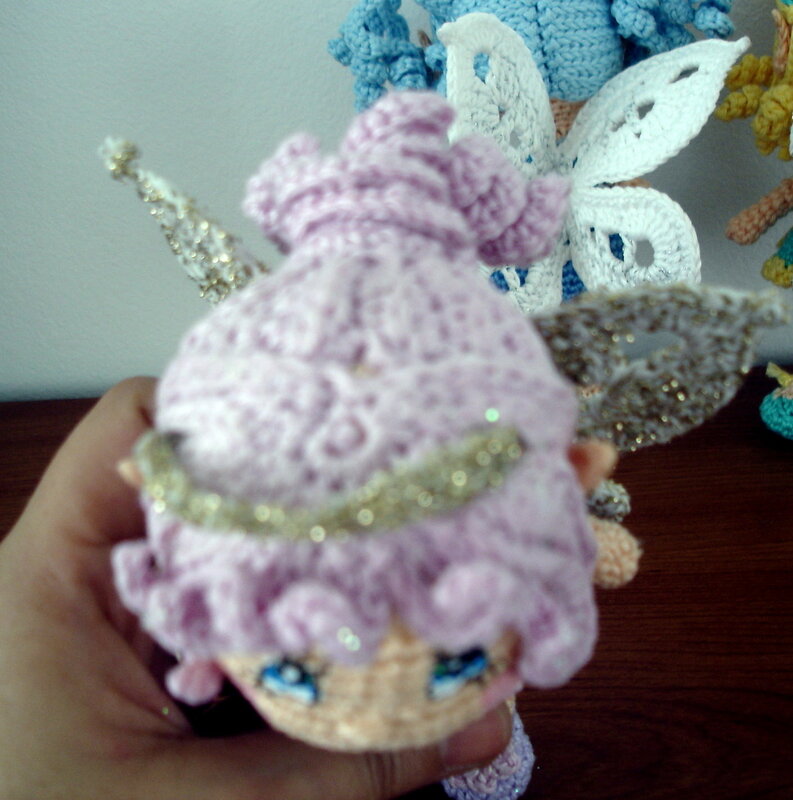 I also used golden and silver thread to add sparkle to the wings. Used some glitter on centers of the flowers I have added as details on hair or shoes. You will also need little bit of liquid fabric starch to harden the wings and to form hair into better shape (I used fabric starch on ears as well). If you will find anything you don’t understand in the pattern, let me know so can help you out. At this point stuff the head best you can. Stuff it firmly to fill all the gaps around R13-17. There should be no empty spaces. Tie off. Stuff more if needed. Ears will be sewn, on sides of the head. Starting row14 – 16 (downwards) and two stitches on row 16 towards back of the ear. You have to stitch 4 stitches in circle shape. We will be making legs first, then joining them together and continuing with the body part that will at the same time make base for the dress. Legs and body are the same pattern as used for BB dolls. If you wish to make flat shoes, with more of leg color showing, change color to skin color yarn you will use and continue from here. If you prefer making closed shoes, as ones we used on BB dolls, continue with shoe yarn color for the next three rows. Repeat from R1-R16 for the next leg as well! Bring both legs together. Safety pin them so they stay close and firm. Change color to one you will use for the dress and continue making the body. Change color to skin color you use for the doll to make final two rows. On R23 (we left with front loops as well) make a dress “decoration”. You can use various edging stitches here. I used the most simple ones, but don’t let that stop you from making beautiful fairy dress you are dreaming of. If you have some nice edging stitch you would like to try out, this is great moment to do so. Pink one: ch3, skip1, sl st, ch3, skip1, slst…..
Yellow/green one: at this one I forgot to left front loops 😀 So instead of crocheting directly on dress, I just made a chain and tide a little bow at front. It is loose. Use same pattern you have used for dress decoration. Change color to one you are using for dress decoration. Pink fairy’s arms are done completely in skin color yarn. Then the shoulders that were done making ch11, sc10 (with picoe at 5th stitch) were sewed at the dress (which was done differently. Is fitting the body, not done as part of the body making process). I warmly recommend making the dress as shown above, rather than making the body and then dress separately, but you can do as you like it better of feel more comfortable with. Hair is done in two major pieces. Front and back. 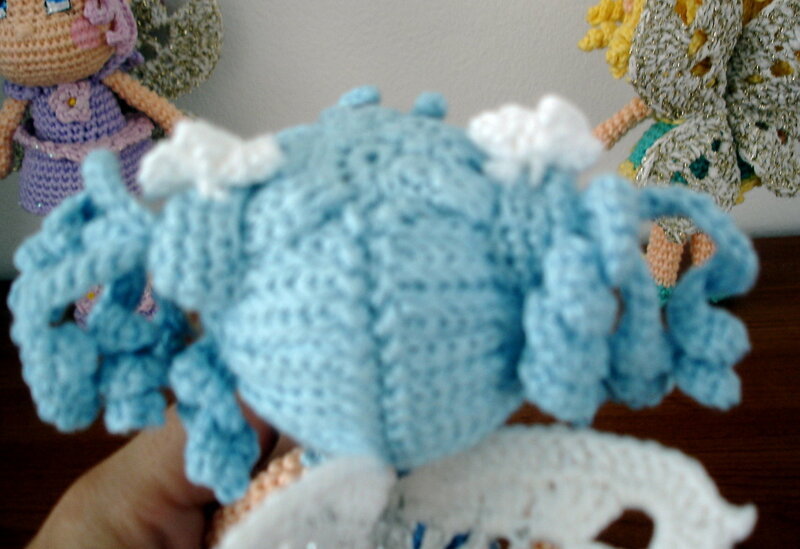 On the back in addition are made ringlets for pony tail and bun to hold the ringlets. 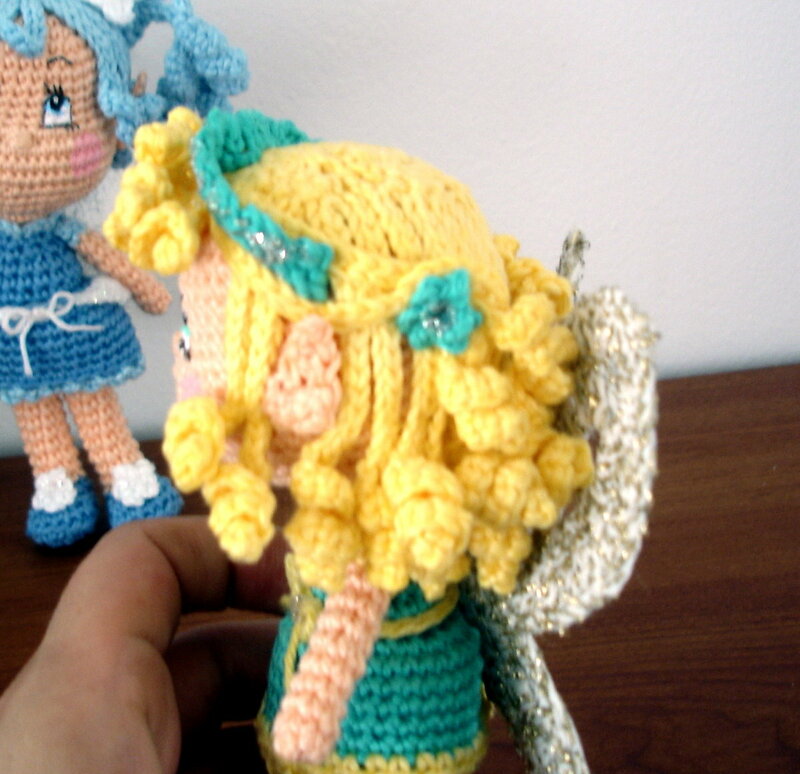 At this fairy’s hair we have no ringlets. Every hair is done with chain and slip stitches on the way back. I will indicate how many chain stitches there are for each hair, for all 16 there are to make this piece. 1 & 2: ch26 (25 slip stitches) – These two hairs (on each side) you will use to wrap and sew around back piece’s edge, behind the ear. 3. 4 & 5: ch17 (16 slip stitches) – Side hairs, placed in front of ear. 15 & 16: ch 26 (25 slip stitches) – back hairs. Behind ear and to wrap to back piece. Make 30 rows like this before closing. Also check if the round piece fits your dolls head. Add row or two if necessary. 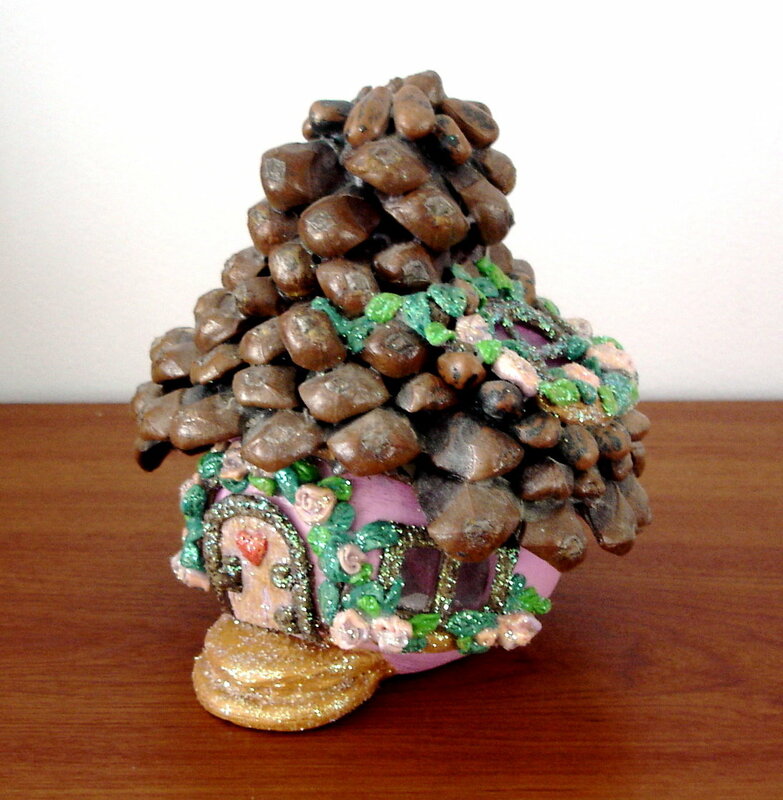 As you have finished all the hair pieces place them on the head. Pin them well before sewing. Place ringlet’s (where they attach one to another) into the bun. You can use little bit of stuffing to tie them in the bun before sewing the bun on the head. Now sew little by little. Starting with back of the hair and the ringlets. When that is done, decorate the front piece. Pin it how you would like hairs to go. Sew the basic lines you wish hair to go and how to look. The final touch you will get by using fabric starch to fix the hair look the way you want it. I used liquid one. Got my fingers wet and used it directly on the hair, forming it and modeling until I felt was good enough or the way I wanted it. Use fabric starch at the end. When doll is completely done. Making the hair look nice is your final touch making the doll. On the back piece, or better said the sides of it, two buns to hold the pony tails were added. 1, 2 & 3: ch21; inc10, sl st10 (20 sts) – two are going behind ear, one in front. You will be working on both sides of the chain. Same procedure as with the front piece; chains and slip stitches back to create hairs. When done connect each hair’s end with slip stitch. Tie off and leave long end for sewing. Now repeat the same for the other side of the chain. 15 stitches, 15 hairs with ch9; sl st8. Connect the ends with slip stitch. Tie off and leave long end for sewing. For wings I used the pattern you can find on the following link. It is butterfly pattern and is very easy to be made. Please note that the pattern uses UK terms! I was looking for firm but yet enough lacy kind of wings and these seemed perfect. I used fabric starch on them as well so they stay firm and really nice. 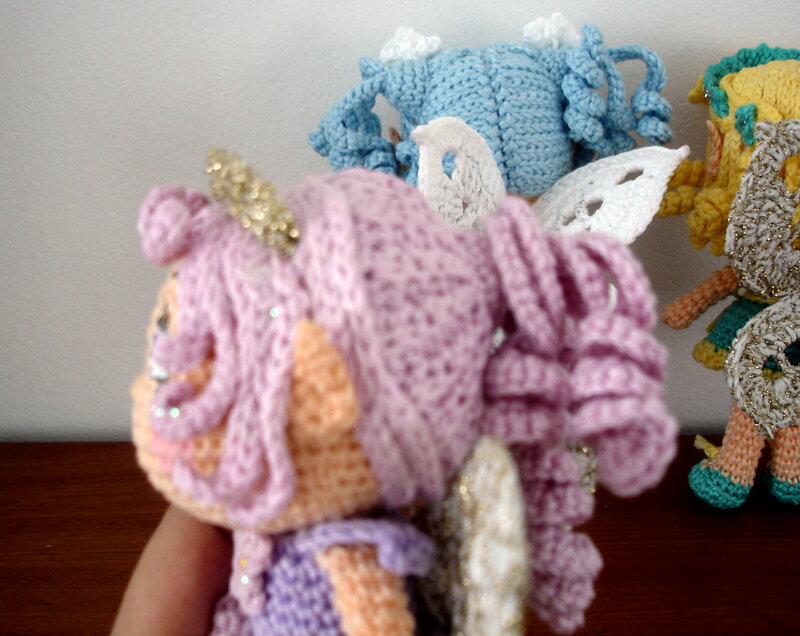 On two of the wings, pink and green fairy, together with white yarn I used a golden thread to make wings sparkling. 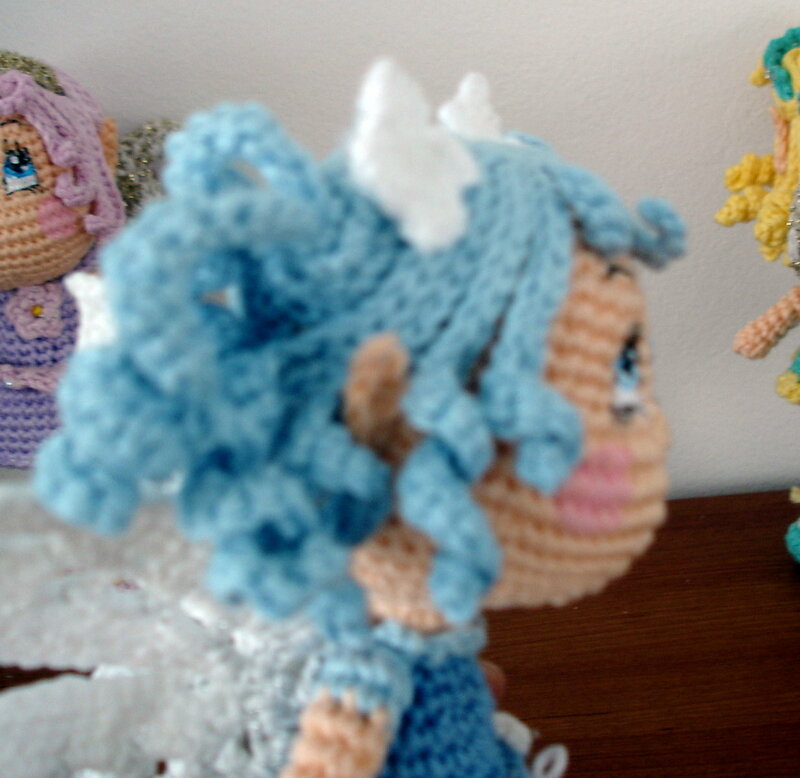 On blue fairy I used silver thread, what I liked more but unfortunately didn’t have enough of it for entire wings. Silvery was just about how I wanted it. Hardly noticed but yet was giving this little touch of magic. Golden thread is little more aggressive for my taste, but you do and use what you have available or like. You can try with different butterfly patterns. There are no limits to ones imagination. I always try to encourage you to try different things, to try adding something own to whole project. I am just giving you idea on what could be done. In this case, possibilities to make the fairy are really endless. You can decorate her dress many, many different ways. 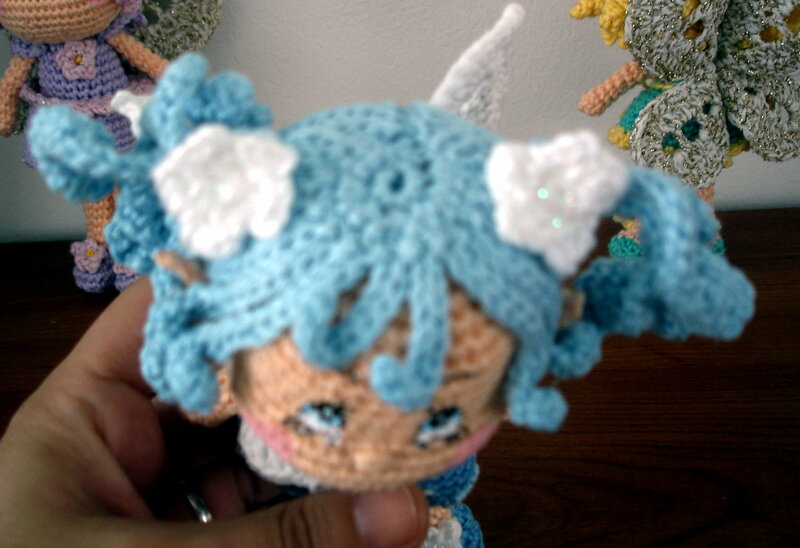 You can add tiny details to her hair, shoes…. You can make hair many ways as well. Here are just three basic patterns that you can work on and make endless hair styles. 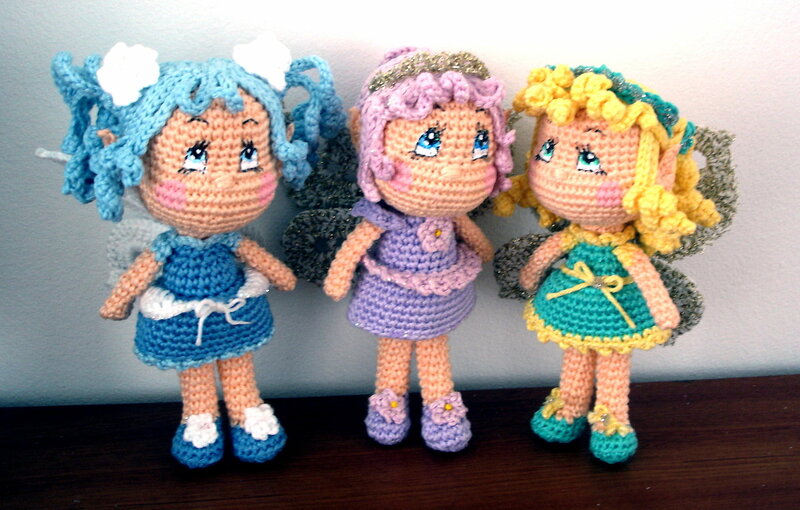 If you wish to bring magic to your finished doll….think magic….make it. You can always ask me for any help. Will be glad to help you and share what I know and can. 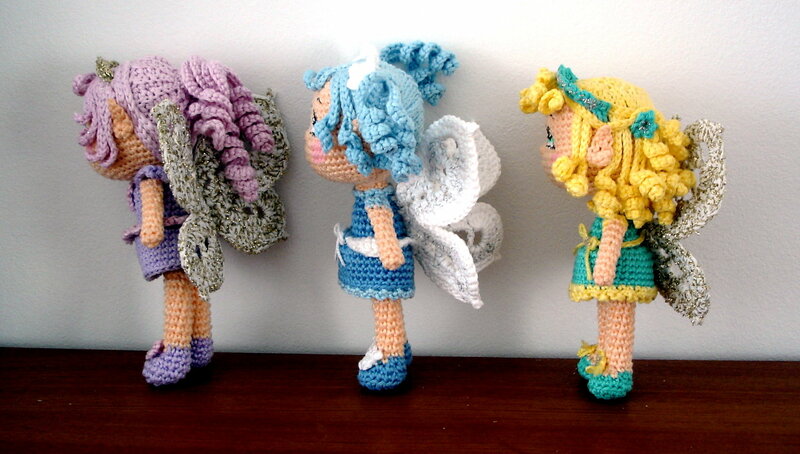 Almost forgot to mention details I have made on the fairies such as tiny flowers, tiaras. Was looking for tiniest flowers I could do with same yarn used for entire doll, but whatever there from the patterns available or those I use often were to big. Ch3, sl st to 3rd ch from the hook, ch2, sl st to the same chain st….repeat to reach 5 petals. Start with sc1 in magic ring, ch1, sl st to magic ring and repeat until you reach 5 petals. Tie off. Both tiaras (on pink and green fairy) were done the same way. Pink one was done with thread so was very loose and had to put it on a wire to stay firm. The second one was done ch3, skip one, sl st1, ch3….. Flowers on blue fairy, one I used in hair were made my usual way. If I have missed anything or you wish to find out more, please feel free to write and ask. 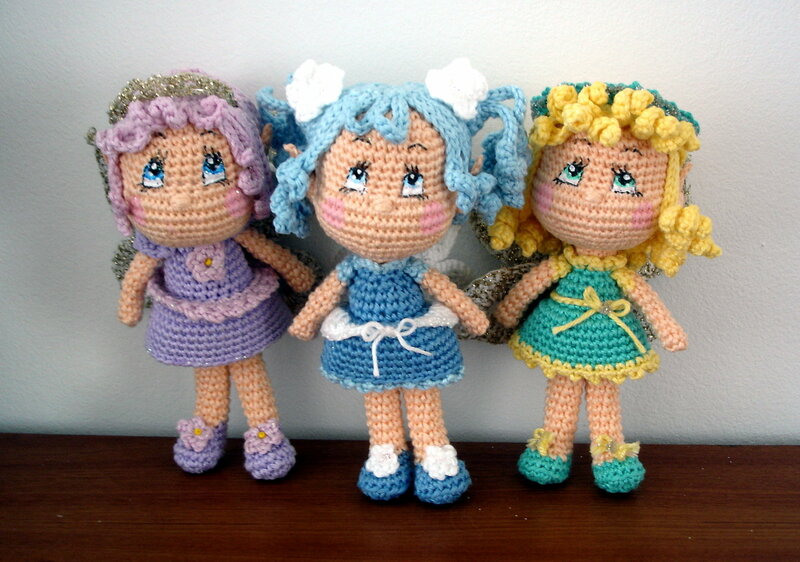 I hope you will enjoy making these magic dolls! Make sure to share you photos with us! This is round 17 of the head, right. Check it and make it this way as written here. This is correct and will work all the stitches in that round. Now we have the base. Fringes are crocheted in magic ring, and are done last, after you finish making all the hairs over R4. The rest of the hairs! Skip one stitch on R4, slip stitch to next and repeat for entire row. Reblogged this on theladyonthelake's Blog.